I found a sweater that I like a lot and that I thought would be a quick knit, something to wear for spring - assuming, of course, that spring weather makes its way to Calgary one day. 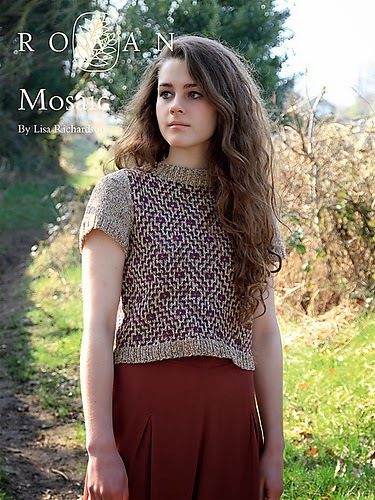 It's the Mosaic pullover from Lisa Richardson. The pattern calls for Rowan Revive and Rowan Cotton Glace. I've got the Revive in my stash - color #466 Marble. Cotton Glace is not one of my favorites as it's quite heavy and the weight of it makes a garment grow. I know. I have an entire sweater knit in Glace. I dug into my stash and found that I have enough Elsebeth Lavold Silky Wool in a complimentary color - medium blue #70, which I think is a discontinued color. In the picture, the main color, the one used in the sleeves and ribbing is the Revive. You may notice that the ribbing flares out a bit. I've decided to use the Silky Wool as the color for the sleeves and ribbing. I'm hoping that the yarn makes the ribbing behave better. I wanted to keep the Revive as the background color for the patterned part, as in the picture. The colorwork is achieved through the use of slip stitches. By switching the ribbing color, I didn't have a contrast color to slip on the first row, so I knit all stitches, fair isle style. From there on, I was off to the races. I did the first repeat of the pattern. However, there appears to be a major error in the pattern. 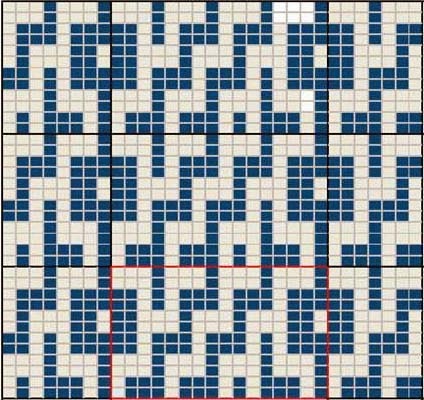 If you look at the mosaic patterning in the picture, the little 'boxes' alternate in position. If you follow the graph in the pattern you end up with the boxes in vertical alignment, stacked on top of each other...as you can see in the picture at the right. The red box is one repeat of 16 stitches and 12 rows. Also, the diagonal lines in the picture go right and left. If you follow the graph, they all lean to the right. This was a topic of discussion on the Rowan Love group on Ravelry and it was agreed that there is an error. Emails have been sent to Rowan and, hopefully, we'll get an answer soon. If not, I'll be getting out my graph paper and working on changing the design myself. The wrong pattern, above, is nice, but not what I was hoping for. I'm prepared to rip out the 12 completed rows if necessary, but I won't go any further yet. In the meantime, I'm swatching for another sweater, Plain Jane by Patricia Roberts, as this will be done as part of a knitalong on Ravelry that starts on April 1st. The yarn for this project is also in my stash. I'm in stash-busting mode these days! I love how "plain" Plain Jane is... the truth is, it is probably one of the plainest PR patterns, but it would seem very difficult and ornate for a number of knitters! Strange, very strange! Please let us know what the answer is. How does it become diagonal?